Intermittent fasting (IF) is THE way to torch massive amounts of stubborn belly fat while building rock hard, lean muscle…said every self-proclaimed “fitness guru” with a radical new approaching to dieting. The reality is that outside of an exceptional set of circumstances involving high body fat percentages and relatively little experience inside the weight room (or steroids), this promise is a virtual impossibility. However, over the past several years, a method of eating, dubbed intermittent fasting, has garnered a near-staggering level of popularity through its revolutionary, or rather an evolutionary approach to food consumption. The overriding concept is simple. During specific windows of time, you will be fasting, or not consuming any calories. Substances devoid of any caloric value such as water, coffee, or certain teas are okay. Following these fasted periods, you will consume the entirety of your daily caloric intake in smaller time frames, placing you in a fed state. There is a plethora of ways that this eating pattern can be executed, but the original concept is to place our eating habits in line with how our deep evolutionary ancestors hunted and gathered food in varying lengths of time. After all, the human body is remarkably adept when it comes to survival, and even today our bodies perform in such a way that facilitates their survival. IF aims to capitalize on this phenomenon. 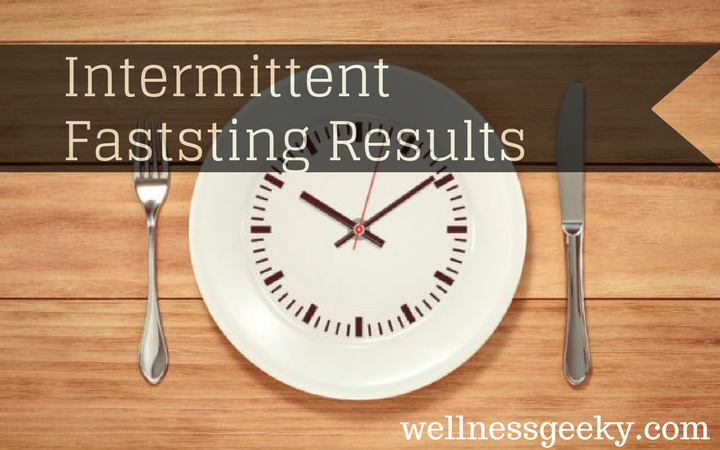 So, how can we accomplish satisfactory Intermittent fasting results? What are the results that others have experienced? All fair questions, and just googling “intermittent fasting” may lead to you merely swinging away on randomized bouts of starvation and small-scale eating disorders in a glorified game of dietary Whack-a-mole in the hopes of landing your dream physique. Despite the many variations, the most famous methods of IF are the “Lean Gains” strategy, the “Warrior Diet,” and “Periodic Fasting.” Read on for the skinny. Originated by Martin Berkhan, Lean Gains follows a 16/8 fasted to fed ratio. Before you close the tab because I subversively snuck math into this article, consider how simplistic this is. Fast for 16 hours, eat for 8. That’s it. No, don’t spend all eight hours eating, that’s just excessive. How you break up your meals in that eight-hour window is entirely up to you though. In Berkhan’s book, he recommends consuming the bulk of your calories in the post-training period, with a smaller, pre-workout meal before training. In a recent study by the Journal of Translational Medicine, subjects were fed three meals, about three to four hours apart, inside of an eight-hour window. During the testing period, training and consumption were heavily monitored, and subjects’ blood samples were tested regularly. For the sake of comparison, the study also included a mirror test group that was not following a time window-restricted feeding pattern.After an eight-week period, the IF group experienced an overall reduction in total fat mass (approximately 3.5 pounds), while the traditional dieting group did not. Both groups maintained a consistent level of muscle mass across training three days per week. The exercise selection included bench press, dumbbell flyes, curls, leg press, leg curl, military press, lat pulldowns, and various triceps isolation exercises. You can read about it here. But wait, won’t I become ravenous with hunger after not eating for 16 hours? The “hunger hormone”, aka ghrelin, is secreted from the lining of the stomach and provides us with that familiar “I’m hungry” sensation. Berkhan describes how ghrelin can be programmed in our bodies after an initial adjustment period to IF. A study conducted by Columbia and Rockefeller Universities discovered that ghrelin works in conjunction with our circadian rhythms to align the anticipation of food with the body’s metabolic processes. In English, please. Your brain tells your body when it thinks it’s going to be hungry and preemptively releases ghrelin to tell you to fill your belly before you’re actually in any danger of starving. This would at least, in part, explain why many from the fasting community describe the initial adjustment period as rough, but then claim that it gradually becomes more stomach-able (sorry, I couldn’t resist the pun). The overarching argument is that the hunger you experience during short-term fasting periods is not a result of your body shedding your hard-earned muscle, but rather an evolutionary response aimed at motivating you to get up and go find food before your body enters its “lock down starvation” mode. Berkhan describes this effect in his blog. The brainchild Ori Hoflmekler, “The Warrior Diet” breaks down IF into an even more straightforward means of application. You eat one meal per day. There are subtle nuances by allowing minor snacks during the daytime, mainly in the form of fruits and nuts. However, more than 90% of your calorie consumption should occur in the form of one meal, preferably at night. Hofmekler argues that humans are nocturnal eaters, tracing this quality back thousands of years. Emphasis placed on not tracking calories and only eating whole food. Don’t waste calories on simple sugars or processed foods. Dr. John Berardi details the 24 hour or “Periodic Fast” in his research on IF. The basic premise is to fast for 24 hours, consuming only water, coffee, green tea, and BCAAs (if you work out). This fasting protocol is to be executed no more than once per week, although some variations of this IF method will allow up to twice per week. You can choose which 24 hours you want to fast and how often. Dr. Berardi touts this method as excellent for trial periods, and while traveling. Okay, but how does this Affect MY Body? I’m glad you asked. A study authored by Jason Fung illustrates the effects that fasting can have on insulin and growth hormone (GH). After nearly six weeks of regular fasting, the tested subject, male fasting for religious purposes, experienced 1,250% increase in GH levels at his peak, and a sharp reduction in blood insulin levels. Lower insulin levels = higher insulin sensitivity. Higher insulin sensitivity = better fat burning and greater muscle preservation. A more detailed explanation of insulin and its fitness function can be found here. The research confirmed that feeding periods, in fact, suppressed the production of GH. Later experiments following the original study of this topic by scientist Hartman et al. found an increase in GH of 500% after a mere two day fast. So, what does this mean for YOU? Growth Hormone is a critical component to preserving lean body mass. So many people fear that they will lose muscle by fasting, but let’s think about this in practical, real-world terms. The reason your body stores fat is because it runs out of room in other areas or your body to place excess energy (calories). Converted glucose, typically from carbohydrates, becomes glycogen, and is appropriately stored in either your muscles or your liver. Excess protein inevitably becomes glycogen itself, and is allocated similarly. This process concerning your fitness described here. Think of a chipmunk storing extra acorns in its cheeks. It may not be able to consume all that energy (food) right now, but it accrues additional stores for later.
. If you were living thousands of years ago, hunting and foraging for food, does it make sense to cleave lean muscle from your body? Or is it more practical to consume the fat stores first? This is not to say that more prolonged periods of fasting (>72 hours) will not consume muscle (some fat is necessary for internal organ and bodily function), but it’s not first in the physiological order of operations. This is how many fitness enthusiasts employ IF today. Utilize shorter bursts of fasting to maximize GH and increase insulin sensitivity, then cash in on feeding periods to maximize muscular development. Okay, so it IS a Miracle Cure Then? Not quite. Some see dieting as playing the lottery. If you’re poor, then you cash in big, you will eventually wind up in worse financial condition than you were before you won the lottery. You have no idea how to maintain wealth, despite the sudden influx of riches. If you live an unhealthy lifestyle, then you engage in the new trendy diet, you may temporarily change your physique, but your body is smarter than you are. It has centuries of programming behind it, and will always return to what it believes to be its natural equilibrium. The idea behind IF is to implement proper internal programming that you can effectively regulate and sustain over the long haul. Ultimately, weight loss (fat loss) or gained comes down to calories in vs. calories out. By reducing your number of meals, your caloric intake becomes easier to track, and you can finally watch your love handles melting. By consuming predominantly whole foods, you mitigate the consumption of empty, fruitless calories. The overall concept hasn’t changed. Although research on IF is still in its larval stage, the returns on these implementations have been generous. Better GH production, higher insulin sensitivity, and more accurate nutrient and caloric monitoring. Celebrities renowned for their physiques such as Hugh Jackman, Terry Crews, and Dwayne “The Rock” Johnson have all tried their hand at, got intermittent fasting results and endorsed the IF approach. Whatever your purposes for buying that first-class ticket to the next revolutionary diet, IF thus far has boasted the results to earn a look.